, Tuesday, April 26, 2016 — Lexington, KY (April 25, 2016) — Always ready to help horses achieve their best quality of life, Accuhorsemat is jumping into service by being a sponsor of the “Hoedown at Hagyard”— an event held during the Rolex Kentucky Three-Day Event to benefit the Retired Racehorse Project (RRP). The Hoedown at Hagyard is an opportunity for Thoroughbred enthusiasts to gather, mingle, and celebrate the breed as well as help to rehome racehorses whose racing careers have ended. “Celebrating to live music with barbecue and bourbon on the Hagyard hill overlooking the Kentucky Horse Park at the end of cross-country day is about as good as it gets,” said RRP President Steuart Pittman. Hoedown at Hagyard will have guests dancing to music from Steve Norman’s Shades of Grass Band, tasting award-winning food from Red State Barbeque, and sampling from an open bar thanks to Bourbon Lane Stable. The event is scheduled for 6:00 pm on Saturday, April 30 at the covered arena at Hagyard Equine Medical Institute. Tickets are available for $50 for adults (RRP members receive a $15 discount). The presenting sponsor of Hoedown at Hagyard is Boehringer-Ingleheim. Other sponsors include Accuhorsemat, Patterson Veterinary Supply, and Triple Crown Nutrition. 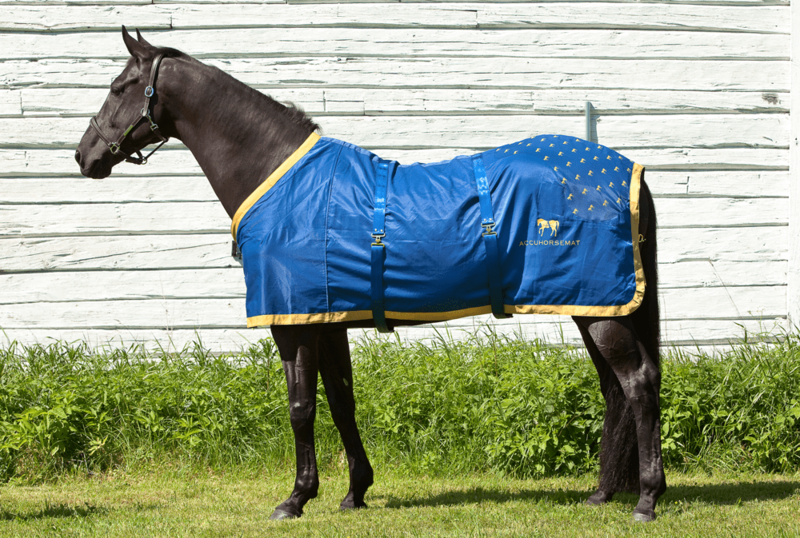 Accuhorsemat, the revolutionary new equine acupressure blanket developed in Sweden, is designed to encourage health and wellness in horses that wear it. Distributed in North America by Acuswede, Accuhorsemat is demonstrating its commitment to equine welfare by supporting the Hoedown at Hagyard. All proceeds from the Hoedown at Hagyard will go towards the Thoroughbred Makeover and National Symposium. The Thoroughbred Makeover and National Symposium is a large training competition that features hundreds of Thoroughbred horses transitioning from a career in racing to one of ten new disciplines. In the competition held during the last weekend of October 2016, horses will demonstrate their training in a new discipline and compete for the title of America’s Most Wanted Thoroughbred. The horse that demonstrates the best trainability and off-track talent will win the coveted title and $10,000 prize. For equine enthusiasts looking for a way to improve their horses’ wellbeing using a simple and innovative solution, Acuswede representatives will be available to share information about the incredible Accuhorsemat at a booth at the Rolex Kentucky Three-Day Event. Accuhorsemat is a non-invasive acupressure horse blanket is designed to promote healthy circulation and recovery through increased blood flow, toxin release, and muscle relaxation. Based on ancient acupressure practices, the Accuhorsemat stimulates acupressure points across the body of the horse to help relax muscles and relieve pain. The specifically targeted acupressure points increase blood flow to the horse’s muscles, allowing them to relax and recover faster after training sessions. The Accuhorsemat can also be used before riding to calm and relax a horse as it soothes muscles and promotes endorphin release. More information about Acuswede and its equine and people products can be found at www.acuswede.com. For information about the Retired Racehorse Project, please visit http://www.retiredracehorseproject.org. Photo: Accuhorsemat, the revolutionary new equine acupressure blanket, is helping race horses by being a partner sponsor of the “Hoedown at Hagyard”— an event held during the Rolex Kentucky Three-Day Event to benefit the Retired Racehorse Project (RRP) (Photo courtesy of Acuswede).